Regiment/Catrawd: 10th Battalion, Duke of Wellington's (West Riding Regiment). Service Rank and Number / Rheng gwasanaeth a rhif: Private No. 13797. Ref No Grave or Memorial / Rhif cyfeirnod bedd: Panel 82 to 85 and 162A. Country of Cemetery or Memorial / Gwlad y fynwent neu gofeb: Belguim. Killed in action on 20 September 1917, during the Battle of Passchendaele (also known as the Third Battle of Ypres) aged 34 years. John Wesley Amos was born in Rhyl, Flintshire, North Wales during 1884. The 1901 Census shows that the family lived at 7 Bodfor Street, Rhyl, Flintshire. The head of the family was Hannah Amos, a widow aged 49, who was a Boarding House Keeper. She had three Children – Jane Chreswell Amos aged 20, John Wesley Amos aged 17, a Solicitors Clerk, Harold Amos aged 14, a Drapers Apprentice. Also living with the family and employed by Hannah was Louisa Williams, a General Domestic Servant. By April 1911 the family had moved to ‘Gresford’, Bath Street, Rhyl. John Wesley Amos was now employed as an Accountant. During August 1914 it is believed that John (known as Jack) was visiting his sister Mrs Jane Rhys-Davies in St. James Road Ilkley, when he attended a recruiting meeting at the town’s Kings Hall on 31 August 1914. A number of men volunteered John (Jack) Amos being one of them and a decision was made to form 2 or 3 Pals Companies. Jack was allocated to the 2nd Company which became ‘A’ Company 10th Battalion, Duke of Wellington’s (West Riding) Regiment. Following training Jack arrived in France on 26 August 1915. 28 August 1915 – This morning had a delightful cold bath in a half barrel tub which my faithful servant Amos had raked out from ‘somewhere in France’. Judging by the colour of the water that tub was, quite recently, closely connected with the butter or cheese industry. 9 September 1915 – Tina sent a parcel of Yorkshire newspapers, for Amos I take it. 8 October 1915 – I am much looking forward to the arrival of the kippers which my darling Ma says she is going to send overseas to join the BEF, I asked Amos and he says the men would love some bloaters. As you say, their diet, especially in the trenches is not very varied. They have plenty of cigarettes and tobacco, a government ration, but long for anything sweet. 16 October 1915 – Amos remembers that the (word unclear) puffs were considerably broken. I happened to be away somewhere, the meal we had for them when I got back, pieces or no pieces, the puffs had almost entirely disappeared. 7 January 1916 – All the same I had quite a good dug-out this time up, quite waterproof from above, though the floor was always about six inches deep, in spite of the faithful Mr. Amos baling it out every day. Of course, my wire-netting bed kept me out of the water. My grateful thanks to Mr Edward Wild for supplying this information regarding Lieutenant Ingham and John (Jack) Wesley Amos. Photograph taken on Saturday 8 April 2017 by Geoffrey Mitchell of Panel 82 at Tyne Cot Memorial, Belgium, showing the name of J. W. Amos. 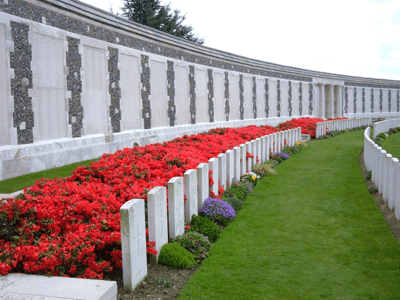 The Tyne Cot Memorial to the missing forms the north eastern boundary of Tyne Cot Cemetery, which is located 9 kilometres north east of Ypres Town Centre, Belgium. On 6 March 1918, a payment of £6.17s.0d was made by the War Office to Jane Creswell Amos, being monies owed to her brother John. On 4 December 1919, a further payment which is recorded as a War Gratuity of £6.15s.0d was made to Harold Amos. 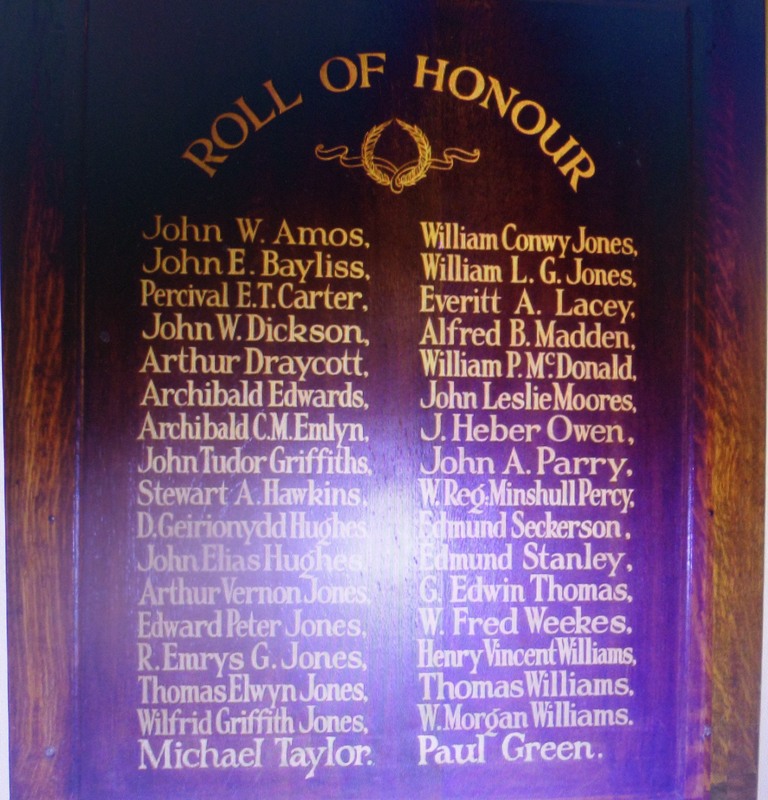 Private John Wesley Amos is also remembered on a Roll of Honour Plaque which was on display at The County School, Grange Road, Rhyl. There is a Flintshire Roll of Honour Card for John Wesley Amos at the County Archives Office, Hawarden, Flintshire dated 17 September 1919 and signed C Davies (sister).